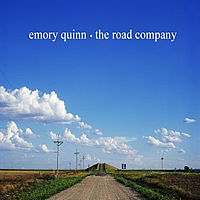 Emory Quinn’s second studio album, The Road Company is an exceptional collection of works so multi-dimensional that it’s impossible to give it a single musical genre label. From love songs and clever lyrics to an almost “Floyd-esque” guitar riff in the sixth track “Blue Gone” the evidence of the group’s array of musical influences, ranging from Jimi Hendrix and Stevie Ray, to Widespread Panic, The Band, James McMurtry, and even our very own Mr. Ryan Bingham is easily apparent. The Road Company, produced by Emory Quinn and recorded at Keith Harter Studios in San Antonio, Texas, is a compilation of twelve tracks, eleven of which lead vocalist Clint Bracher wrote, and the twelfth is a cover of “Phone Went West” originally written and performed by Jim James of rock band My Morning Jacket. The opening track, “Highways of Gold,” is a recollection of life on the road as a young band and is a nice cruising tune that hits you with an unexpected change in tempo near the end. The imagery and lyrics here are fantastic. “Dance With Me,” the next track on the record, is a tribute to a few of the late great “Johns” (Wayne, Cash, and Lennon) of the past, and has a real “dance with me” feel to it, as it is aptly named. “Ships and Planes” has a very Bob Marley sound, and although the subject matter is not at all that of an island vibe, the song almost leaves that feel ... very clever. My favorite track, “Blue Gone” begins with a very fluid sound and morphs into an intriguing two- minute guitar solo at the core of the song that left me thinking none other than “Comfortably Numb.” It is an incredible tune. Dig it, period. “Idabel” is a very catchy, up-tempo tune about a renegade trying to outrun his past through Texas and New Mexico. It is a super cool song. “Better Next Year” is another with an unexpected change in tempo, this time slowing things down a little and then picking back up for a really cool finish with the faint sounds of a banjo. “Dear London,” Straight Through Me,” and “Magnolia” are the ballads on the record, each with a different feel and none of them repetitive. “Dear London” brings in that classic Emory Quinn tempo change, with another great guitar riff at the end of the song. Closing out the record is a cover of “Phone Went West.” Appearing on At Dawn, the 2001 release from the band My Morning Jacket, the song is, as it is on that record — by accident — the 12th track. While an incredible song in its original form, Emory Quinn cuts it in a bluegrass style that is completely brilliant, and upon second thought, could it be my favorite on the record. The crystal clear sound of this record is nothing short of the result of the relationship that these guys possess. They work together flawlessly, and their chemistry is clearly heard through the incredible music that they create. Diversity in their sound, surpassed only by the array of instruments that they each play makes them a jewel in this business. You can bet, with quite certainty that these four will be around for a while. Check them out soon. You will not be disappointed. Emory Quinn is Clint (Quinn) Bracher, Nathan (Emory) Rigney, Casey (Case) Bell, and Troy Rios (Touring Drummer).